The Maruti 800 is back up to 18.5% share in India. It’s a very impressive surge for Indian new vehicle sales at +20.1%, smashing the all-time volume record established just last month at 923.599 deliveries. That’s the first annual result above 800.000 and 900.000 units in India. Despite already commanding an ultra-dominant position, Maruti (+19%) manages to almost match the market, leading to a 42.5% share. Tata (+34%) lodges a 4th double-digit gain in the past 5 years to cement its 2nd place at a record 18.9% share, widening the gap with its immediate follower Hyundai (+17%) seeing its share thaw to 13%. Mahindra (+34%) is also very dynamic, hitting a round 10% share this year. If Fiat (-63%) was the success story of 2002, Toyota (+58%) quickly replaces it in 2003 and is back in the Top 5 whereas the Italian carmaker implodes to #10. Ford (+24%) and Honda (+29%) outpace the market but Hindustan (-22%) drops to #8. Chevrolet (#14) and Mini (#18) arrive. 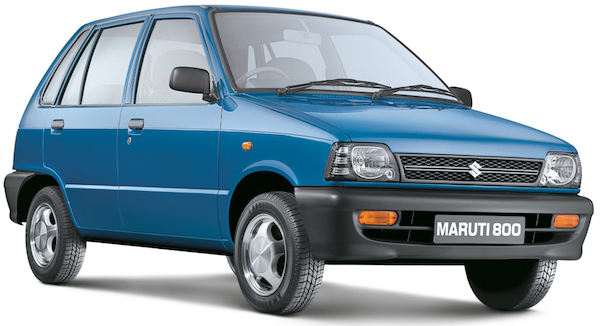 The Maruti 800 (+24%) gets a second wind to 170.000 sales – its highest volume since 1999 – climbing back up to 18.5% share, unlike the rest of the Top 5, unchanged on 2002 but the Hyundai Santro (+16%), Tata Indica (+4%), Maruti Zen (-3%) and Omni (+2%) all lose share year-on-year. The Wagon R (+39%) and Alto (+62%) make it five Marutis in the Top 7 for the first time in history. The Toyota Qualis (+23%) is back inside the Top 10 at #9, alongside the Hyundai Santro and Accent (+26%) the only foreigners in the Top 15. Tata lifts its presence to 4 nameplates in the Top 12 thanks to the Indigo – an Indica sedan – ending its first full year of sales at #12. The Toyota Corolla lands at #24 and the Chevrolet Optra at #28. Full Year 2003 Top 20 All-brands and Top 65 All-models below.